Craft villages have always been a fascination. 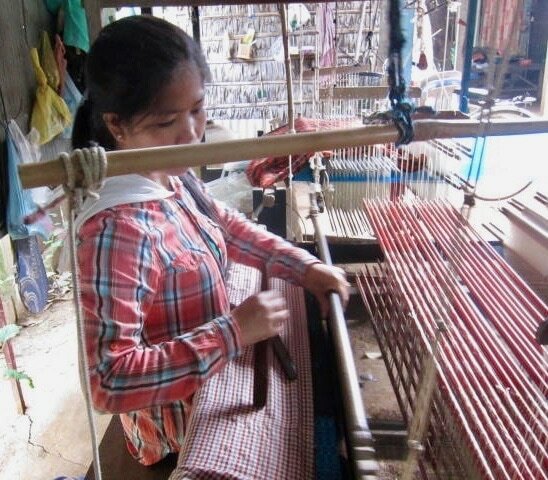 Here in Cambodia what really focuses the attention is household ikat weaving still common in many villages and so much a part of local histories. I read a long time ago that the secret to Italy's success in the fashion industry is the quality of cloth made by its weavers. 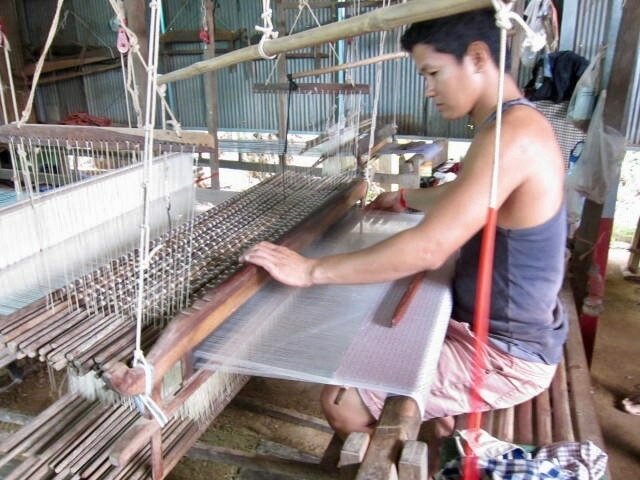 Here in Cambodia, men not just women compete on the looms for design innovation and for quality. Other villagers judge them on their efforts, so the competition, though quiet, is front and center. Family members weave full time and part time, whenever there is a moment. Farm work is very seasonal here so between seasons, the loom beckons and the family takes turns at the loom. There is a good market for Ikat weaving so weaving is a core component of family income. Women often have a day job selling food and snacks in the schools, but then, they sit at the loom after work. It is also heartening to see that in some families, children learn the trade by mostly inheriting hand skills and design knowledge from their grandparents. And as the quality of village weaving is discovered by the tourism industry and custom tailors, maybe in the future, they too, will be become the soul of the fashion industry in this country. In the first family, Nara welcomed us and introduced me to her older father and mother who are now spinning silk thread from the silk worms they raise and the women and men of working age design and weave, each one competing in the design created. I was enthralled to see the design each of them proudly presented sitting at their own looms. This family once worked for the Japanese Kikuo Morimoto, whose passion for silk led him help Cambodians preserve their heritage of producing some of the best silk in the world. 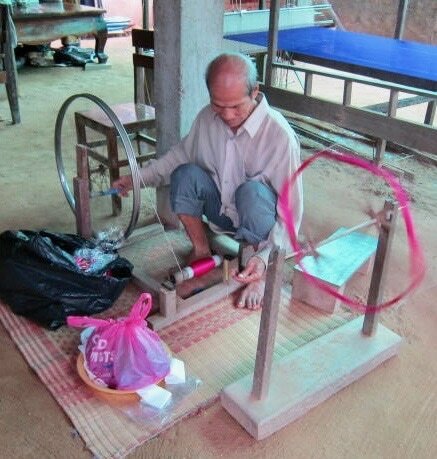 When they moved to Preah Brokorng to be close to Phnom Penh, they continued weaving, still using what they had learned from the IKKT, the Centre Morimoto founded. Now, they have an established weaving operation under their house. Village houses are often up on stilts to keep them dry during floods and to create an open air workspace the rest of the year. 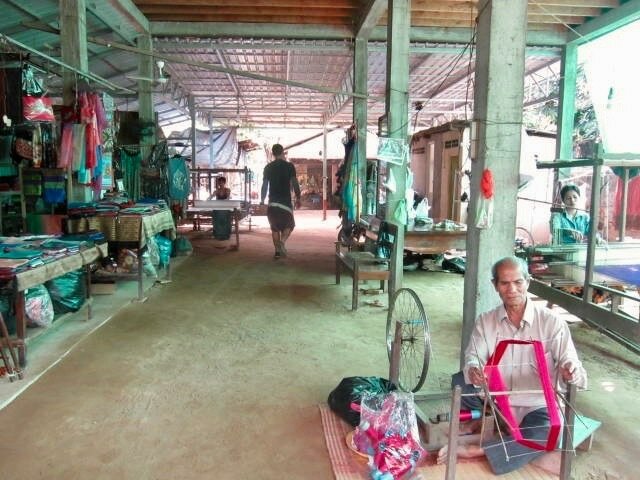 This family is happy to involve those interested in learning about Cambodian weaving in their work. 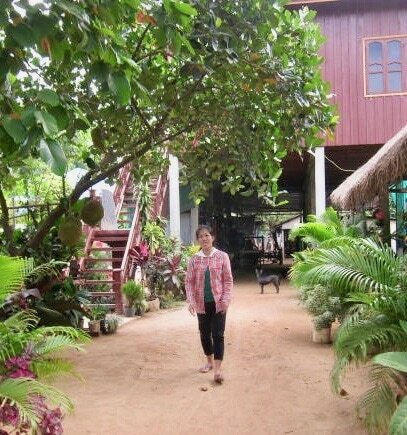 Visitors to Silk Island can walk or cycle to this tiny village to see first hand the Cambodian silk legacy. The second family inherited their trade from their grandparents. To complete your trip, you can order lunch before hand from these families and enjoy the unique taste of local cooking or you can go and visit other interesting places in the village. You can even go horseback riding. I have a special recommendation. Go and visit a century old temple, Wat Mkot, and walk around its 15 hectares of tree filled pathways. 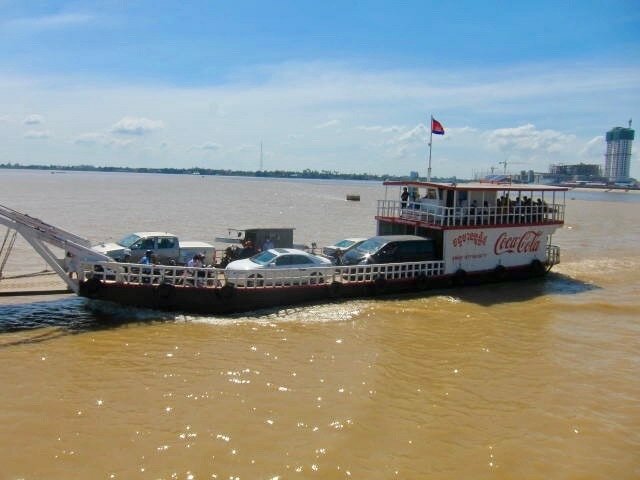 Just a short ferry ride from Phnom Penh to Areiksart and a walk or a ride in a tuktuk, this is a wonderful way to spend your day. You can also bring your car in the ferry so you can go around the island. You can buy souvenirs from these workshops or have your own custom made hand woven silk fabric with traditional Ikat design knowing that you are not only helping preserve a powerful tradition, but are building your understanding of a vibrant culture.